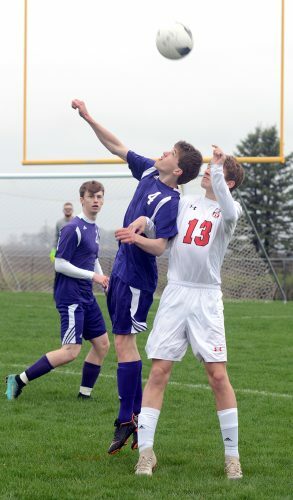 JEFFERSON — Logan Peters stamped his claim to the title of best distance runner in the Heart of Iowa Conference Tuesday night. 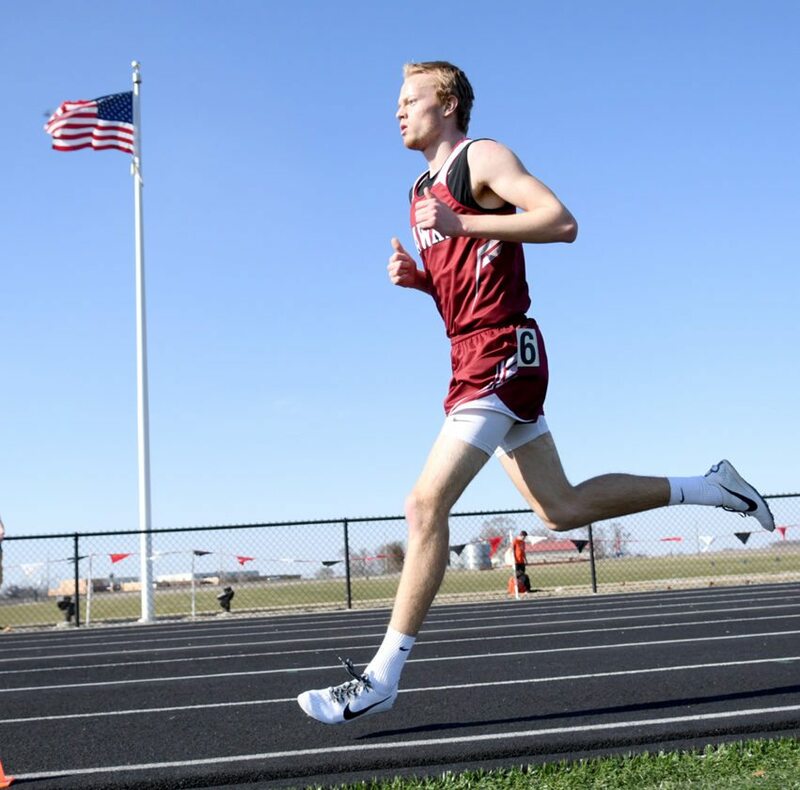 The South Hamilton junior jumped in front of a longtime nemesis to win the 3,200-meter run and then returned to the oval later in the evening to win the 800 at the league track and field meet. Logan Klemp added a conference title in the shot put and the Hawks put up 52 points to share fifth place with Greene County. Gilbert claimed the team crown with 135 points and Nevada was second with 118. The meet was halted after the 400 hurdles due to the weather. The 1,600, as well as the 4×100 and 4×400 relays were canceled. South Hamilton brought home five medals, with Peters and Klemp responsible for four of them. The Hawks’ 4×800 added a bronze medal. Peters, already the school’s record holder in the mile and two-mile, fended off Nevada’s Malachi Hornbuckle down the stretch to win the 3,200 in 10:13.82. Hornbuckle crossed in 10:15.60. Still in search of the school record in the 800, Peters put the field on notice early and cruised to a winning time of 2:03.46, more than four seconds ahead of silver medalist Keegan Sturdy of Gilbert (2:07.99). Klemp, a 2017 state medalist in the shot put, found his form and it translated into a top throw of 50 feet, 91⁄2 inches. He was the only competitor to reach 50 feet. The senior and University of Iowa football recruit tacked on a third-place finish in the discus. His best throw measured 128-2. Quinton Grove, Freddie Lewis, Cole Berg and Josiah Brown teamed up to grab the bronze for the Hawks in the 4×800. They completed the eight-lap race in 8:38.07. Hailey Cavan, a South Hamilton sophomore, won an individual gold medal and then anchored a relay to another top finish at the conference meet. 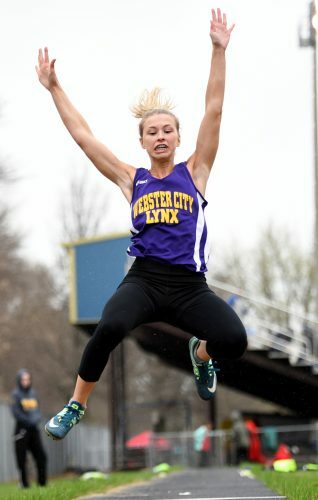 Cavan was the first to the finish line in the 100 hurdles with a time of 16.87 seconds, a blink in front of Gilbert’s Lydia Berns-Schweingruber (16.98). Cavan was also on the anchor of the Hawks’ gold-medal shuttle hurdle relay (1:13.30). Emily Greenfield, Bridgit Schlafke and Rylee Woodall ran the opening three legs. Lily Skartvedt added a bronze medal in the discus for the Hawks. The best of her three tosses was 101-6. The Hawk girls’ team compiled 36 points to finish eighth. North Polk (129) and Prairie City-Monroe (104) held down the top two spots. 1. Gilbert 135; 2. Nevada 118; 3. North Polk 1141⁄2; 4. Roland-Story 671⁄2; 5. (tie) South Hamilton and Greene County 52; 7. Saydel 42; 8. Prairie City-Monroe 41. Shot Put — 1. Logan Klemp 50-91⁄2; 12. Dominic Summers 40-4. Discus — 3. Klemp 128-2; 12. Cade Flaugh 108-8. Long Jump — 9. Brandyn Feighner 18-6; 14. Mohomed Yokie 14-0 1/2. 100 Meters — 14. Trevor Thompson 13.54; 15. Flaugh 14.31. 200 Meters — 11. Sam Lewis 25.27; 16. Thompson 26.92. 400 Meters — 8. Josiah Brown 56.48; 12. Ty Skartvedt 1:00.52. 800 Meters — 1. Logan Peters 2:03.46; 9. Cole Berg 2:14.01. 3,200 Meters — 1. Peters 10:13.82; 13. Logan Austin 13:40.48. 400 Hurdles — 11. Feighner 1:06.52; 15. Lane Swenson 1:10.09. 4×200 Relay — 8. 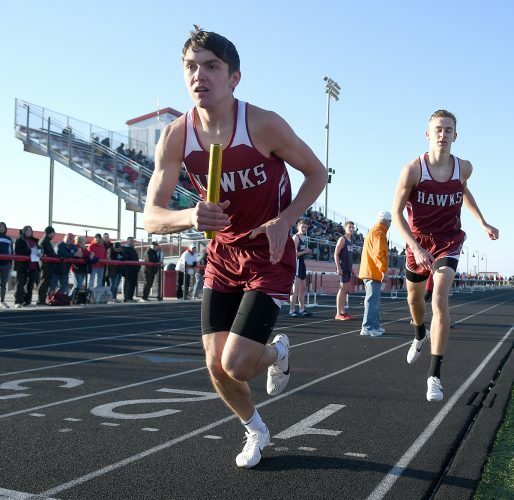 South Hamilton 1:45.04 (Brock Galetich, S. Lewis, Thompson, Preston Stoecker). 4×800 Relay — 3. South Hamilton 8:38.07 (Quinton Grove, Berg, Freddie Lewis, Brown). Sprint Medley Relay — 7. 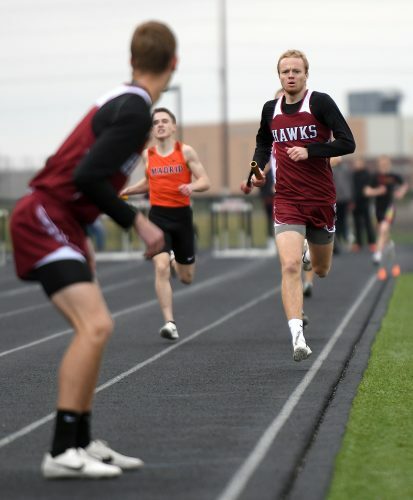 South Hamilton 1:50.76 (Galetich, S. Lewis, Ethan Young, Skartvedt). Distance Medley Relay — 5. South Hamilton 4:00.84 (Galetich, S. Lewis, Grove, F. Lewis). Shuttle Hurdle Relay — 7. South Hamilton 1:11.33 (Swenson, Stoecker, Galetich, Feighner). 1. North Polk 129; 2. Prairie City-Monroe 104; 3. Gilbert 91; 4. Greene County 85; 5. Roland-Story 61; 6. Nevada 57; 7. Saydel 42; 8. South Hamilton 36. Discus — 3. Lily Skartvedt 101-6; 15. Brenna Barquist 60-9. Shot Put — 6. Skartvedt 31-7; 12. Barquist 25-93⁄4. High Jump — T9. Sydney Friest 4-4. 100 Meters — 11. Emma Heeren 14.88; 13. Emma Lewis 15.05. 200 Meters — 13. Bailey Martin 30.63; 15. Bridgit Schlafke 31.97. 400 Meters — 14. Sierra Flores 1:19.23. 800 Meters — 9. Breanne Diersen 3:09.22. 100 Hurdles — 1. Hailey Cavan 16.87; 8. Rylee Woodall 18.09. 400 Hurdles — 9. Heeren 1:18.77. 4×200 Relay — 6. South Hamilton 2:02.78 (Martin, Heeren, Schlafke, Lewis). 4×800 Relay — 6. South Hamilton 12:33.12 (Natalie Johnson, Diersen, Marissa Jensen, Maddison Freeman). Shuttle Hurdle Relay — 1. South Hamilton 1:13.30 (Emily Greenfield, Schlafke, Woodall, Cavan).